Mobile Harbour cranes; these are multipurpose crane designed and suitable for handling heavy loads, containers, create goods, bulk goods with electro hydraulic or mechanical grab, steel & scrap metal with hydraulic or mechanical grab. - Providing pre-feasibility analysis to confirm viability of projects. - Ensuring that the developer has the best available partners in terms of operators, cargo owners and financiers. - Ensuring that developers obtain the maximum benefits from Concession Agreement negotiations. Supplying spares and taking maintenance contracts at all Indian ports. Gateways to growth, ports play an important role in the economy, facilitating domestic & foreign trade. At Bluewater Marine Consultants Pvt. Ltd. we are dedicated to deliver the best of Industry experts to the Costumers for carrying out a FPSO Mooring Operation. We have been actively involved in carrying out the mooring operations at Ebok Terminal under Ivorene Oil Services Nigeria Ltd., which is a spread moor fixed heading FPSO. Our history and experience in Infrastructure development has poised us to be able to deliver a world class, all weather port in the coastal city of Porbandar, Gujarat. J. M. Baxi & Co. is India's first privately owned company to run its own terminal in the port sector in India. It was developed a Bulk terminal at Rozi, Jamnagar since 1998. 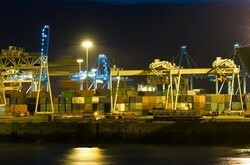 In 2003, the first container terminal at Visakhapatnam port was set up and is now fully operational. - J. M. Baxi & Co. is India's first privately owned company to run its own terminal in the port sector in India. It was developed a Bulk terminal at Rozi, Jamnagar since 1998. - In 2003, the first container terminal at Visakhapatnam port was set up and is now fully operational.